As usual, I’ve come late to the party of popular books. This Booker short-listed title is a strange and creepy Gothic story set in England in the years after the second World War. This period is one of transience – where century old social customs, hierarchies and grand family estates that have been in families for generations are crumbling down everywhere. The Little Stranger is narrated by Dr. Faraday, the only son of a maid and grocer whose parents have invested all their energies and money into their son’s education so to give him the chance to rise up in the world. Faraday’s mother, once a nursery maid at the majestic mansion called Hundreds Hall, first takes Faraday to the mansion as a boy and who later returns as a middle-aged bachelor (this point is strongly emphasised). Called to the hall one day to look over the Hundreds Hall only maid, a fourteen year-old girl named Betty, Faraday is shocked to see the mansion in such disarray. Half the mansion has been closed off, a lot of the estate’s land has been sold off to developers for Council houses and the Ayres family seem to live in constant poverty. The remaining occupants of the Hundreds are Mrs. Ayres, who is nostalgic for the old days, and her two grown children, Caroline and Roderick, who is physically and mentally scarred by war. As the ‘master’ of the house, Roderick does whatever he can to save the crumbling estate. Other strange and unexplainable things begin to occur that suggests that Betty may be right and that there is something in Hundreds Hall. Queer scorch marks are found under the paint in Roderick’s room, phones begin to ring in the middle of the night even though the telephone exchange has no record of anybody ever calling the Hall and strange, incessant noises lead them to bizarre childish handwriting on walls. 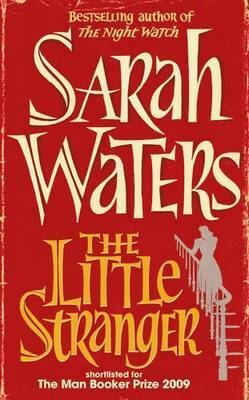 While there are creepy elements to The Little Stranger, it is not essentially a ghost story but rather an exploration of the quickly disappearing social classes, their wealth and sweeping new modern reforms such as the Health Service and affordable housing for all. While I did enjoy Little Stranger, I was expecting more of a ghost story and was slightly disappointed it wasn’t more so. The creepy parts were really quite frightening even though the ‘stranger’, whatever was in that house, is never identified as anything more than a dark blur at the corner of the eye and as a ‘he’ by Betty. Other reviews have compared similarities to Henry James’ The Turn of the Screw, where the fear and creepiness comes from what you’ve imagined yourself, and I have to agree. Dr. Faraday got on my nerves more than a few times by his sheer inability to open his mind and his stuffy attitude towards everything. I did wonder though, how easily accepting readers are (or at least I was) to the supernatural aspects rather than the rational. While there was no concrete proof of a ghost, I was more ready to believe the Ayres’ stories than Dr. Faraday’s explanations. The book was a tad too long and I thought some parts were sloppily edited. It could have easily been shorter. Sounds interesting. Although, being the complete wussy person when it comes to frightening things, I wonder just how intense the fright is. Is it “keep you up at night until you get to a good resolution/the end” type of book? I’m a complete wuss too! There are some frightening bits that will make your skin tingle but nothing really horrifying. You can always bury the book if it gets too much. 🙂 The scary bits are quite sparse though which was slightly disappointing but this is a book that can be read in two or three sittings. I don’t usually go for eerie Gothic type novels 🙂 but his sounds like something I’d really enjoy, despite the need for better editing. Yes, I suspect this might not be one of Water’s best and this is my first Waters. I’m still meaning to read Fingersmith which is the one that has received the most praise. Tipping the Velvet sounds really interesting too. Hmmm. I borrowed this from the library and read a few chapters, but was not impressed, so I returned it. Then, I found a copy buried in my TBR pile, so I’m probably going to have another go at it. I like Waters’ other books, but this has been a bit hit and miss for a lot of people. And yes, longer doesn’t always translate to “better”. I found the beginning quite difficult to get into too – largely since I was expecting a ghost story right from the beginning. There were parts where i thought Waters just waffled on with no point and which could have been more tightly edited. Could have easily been shorter than the 499 pages. A library not stocking the latest Sarah Waters AND a Booker short-listed title?! That’s cruel! I hope you get yourself a copy soon. LOL I didn’t find it particularly scary – though I might have if I’d seen it as a movie. Who/what do you think the little stranger is? I went to a talk by Sarah Waters when she was in Australia a couple of months ago but she wouldn’t engage in this question – she said she left it open but felt she’d given enough clues. That the ‘stranger’ is actually Faraday. Since there’s a supernatural element to the story, I think it’s Faraday’s subconscious. Him being in the car when Carolyn died sort of nailed it for me. He says he fell asleep and doesn’t remember much besides that. He could have been sleep walking, astral projection, etc. It also makes for a nice contrast with Faraday’s adamant rationality. And there’s no denying that he absolutely wanted that house more than anything else. What did you think it was?